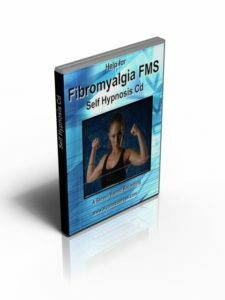 This Fibromyalgia Hypnosis recording can help the symptoms of Fibromyalgia Syndrome FMS. FMS is a disorder that brings both a sense of exhaustion and pain. As you will know already FMS can affect the whole body robbing you of your energy and bringing with it sensations of pain. Unfortunately there is no known remedy for FMS. I would like to share with you my thoughts about using this cd. I was diagnosed with FM in 1997 having been ill for 3years. This CD is a great ‘tool’ to help with the relaxation so readily needed when you are having an ‘attack’, this helped me with the pain and aided a restful sleep, something that seems to be so elusive to FM sufferers. Fibromyalgia has also an association with what are called mood disorders. Typically this means that a person may sometimes register somewhere on the spectrum of depression. You may have noticed that you are particularly affected by other people’s moods and what they say and how they treat you. You may be quick to be hurt emotionally by others. A drop in your mood may trigger an FM attack. As stress may have been a major contributor to the onset of FM, it is vital to introduce a means to aid your relaxation and reduce your stress levels. Self hypnosis is a practice that when used regularly reduces stress and encourages relaxation and well-being. In 1991 a study was conducted on the potential positive effects of hypnosis on fibromyalgia. The results were published in the Journal of Rheumatology. The study concluded patients who used hypnosis experienced significant pain reduction, less fatigue and better sleep patterns. This professionally authored hypnosis cd or mp3 download for fibromyalgia encourages relaxation and the ability to reduce the emotional hurt experienced because of past or future events. It was inspired by a close personal friend of the London hypnotherapist Steven Harold who suffers from fibromyalgia. for the symptoms of Fibromyalgia FMS?